Jews Reject 60 Years of Israeli Terrorism and Apartheid against Palestinians! Jews across Israel and United States of America stood up against the zionist lobby when they rejected 60 years of Israel’s existence as nothing more than apartheid and injustice to Palestinians. 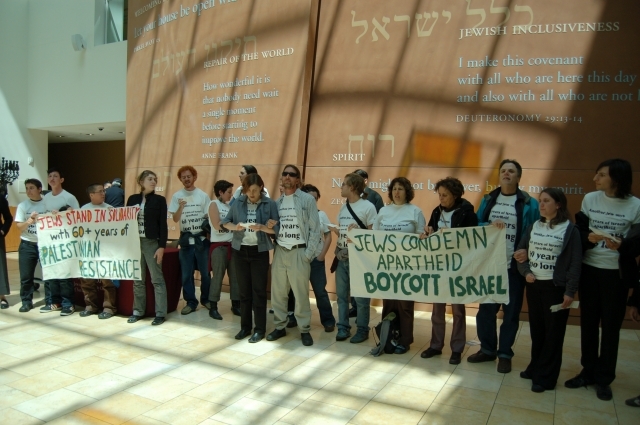 It sent a strong message to the Lobby that injustice will no longer be tolerated in the name of Judaism. While Israel provided a home for Jewish refugees after the Holocaust, some from our own families, the terrible fact is that over 700,000 Palestinians were made into refugees to make room for the future state of Israel. Sixty years and several generations later, that number has swelled to an estimated seven million. Many live in 58 registered refugee camps dispersed throughout the Middle East, still denied their rights under international law. That is why the creation of the state of Israel is known as the Nakba, or the Catastrophe, to Palestinians. Today the Palestinian Nakba continues. Inside of the 1948 borders of Israel, Palestinian citizens are denied legal rights received by Jews. Palestinians in Gaza, the West Bank, and East Jerusalem are denied access to land, water, health care, and other basic resources. Palestinians throughout historic Palestine experience international isolation, economic devastation aided by the erection of a 730-kilometer wall, and continued closures and invasions including the current horrific siege of Gaza. And that is why many of us are refusing to celebrate: as long as Palestinians are still fighting for their fundamental human rights, we cannot rejoice. As Jews, we are members of a community that has repeatedly suffered exile and ethnic cleansing. We refuse to remain silent while this oppression is perpetuated upon another people in our name. To this end, we will continue to work within Jewish community and also in solidarity with Palestinian community, as we seek a self-determination for Jews that does not depend on the displacement and oppression of another people.